Since the early 1980's, the Canadian Navy has employed satellites as part of their communications network and over the years, the system has grown into a highly complex web. This section provides information on the technology that is in use today and future developments which will address the needs of the Canadian Armed Forces. The following information is current as of 1995. Military satellite communications architecture (MILSATCOM) uses techniques such as spread spectrum, nulling, and on-board processing that is intended to provide anti-jamming immunity, low probability of intercept and low probability of exploitation. These features make MILSATCOM more robust than commercial satellite communications (SATCOM) and more suitable for the support of military operations. Present planning (1994), proposes that Department of Defense SATCOM requirements be met by a general purpose SATCOM system (GPSS) provided by commercial space segments as well as a highly survivable SATCOM which would be provided by a special purpose SATCOM system (SPSS) using a military space segment. Provide national coverage via leased domestic SATCOM services. Provide global coverage via leased SATCOM services. Provide protection against unauthorized access to the satellite command link. Accommodate the transfer of encrypted data, terminal-to terminal and be interoperable with the systems of other Government of Canada departments (OGD's). Provide national coverage through an assured space segment. Provide global coverage through arrangements made with Canada's allies. Provide for military control of the satellite system. Operate in a hostile electronic warfare environment. Be interoperable with the systems of our allies. Have flexibility to meet operational requirements on short notice. Provide full military encryption and traffic flow security. Several years ago, a three phase approach was adopted to achieve a MILSATCOM capability for the Dept. of National Defence. In Phase I, the main focus was research and development (R&D). It included a number of R&D projects designed to develop SATCOM expertise in the Canadian Forces and Canadian industry. During this phase, a Mobile Anik Satellite Terminal for Extension and Restoral (MASTER) was developed. Phase I also sought to develop operator expertise by affording hands-on experience with commercial SATCOM. As of 1994, Phase I is essentially complete. An R&D project was initiated to provide a functional Extremely High Frequency (EHF) SATCOM emulator for evaluation and test. Acquisition of commercial SGT's for the North Warning System. Use of US Navy WSC-3 UHF satellite ground terminals. The Anik E telemetry, tracking and control has been encrypted. A number of INMARSAT terminals have been purchased. Personnel have been trained in SATCOM operations. The MASTER base station at Valcartier has been upgraded. This final phase of the DND SATCOM plan entails a major crown project designated G1945, the Canadian Military Communications Satellite system (CANMILSATCOM) which will address the stated operational requirements of the Canadian Forces for global satellite communications in the post-2000 era. Satellites operate on three major frequency bands within the radio spectrum - ultra high frequency (UHF), super high frequency (SHF), and extremely high frequency (SHF). The SHF and EHF bands are further subdivided for the purposes of assigning frequencies to specific functions. The table below shows the various frequencies and their sub-divisions and some of the satellites which operate in these bands. Where frequencies are separated by a slash, these numbers represent uplink and downlink transmissions respectively. Sufficient bandwidth separation has been engineered so that uplink and downlink communications to not cause mutual interference. The Bandwidth column indicates the amount of bandwidth used by both the transmitter and receiver. In 1992, the Department of Defence was paying between $7 to $10 per minute for use of space segments on some of these satellite systems. The latest generation of Canadian Domestic Satellites (DOMSAT). Two satellites are owned and operated by Telesat Canada. Communications between satellites through space. This type of communication takes place directly between satellites without going through a ground station. The Defence System Communications Satellite for the US Armed Forces. X-band worldwide coverage. Currently comprised of DSCS II and DSCS III satellites which will be replaced in the 2000 to 2005 time frame. Latest generation of DSCS satellites. Plans are to incorporate Ka-band coverage. Domestic Satellites; a generic term applied to a satellite system which provides services for a specific country (such as ANIK in Canada). Fleet satellite; US Navy, UHF, worldwide coverage. International Maritime Satellite. An organization which provides maritime communications via four satellites over the Pacific, Atlantic and Indian oceans. It has 68+ member countries. Canada's interests are represented by Teleglobe Canada. International Telecommunications Satellite. An organization of 120+ countries which provide worldwide communications via four geostationary satellites. Canada is represented by Teleglobe. Japanese Communications Satellite. A Ka-band satellite covering Japan and owned by the Japan Communications Satellite Corp of Tokyo. Used by the US Navy for Fleet Broadcast; UHF, worldwide coverage. A commercial L-band system operated by COMSAT and covers the Atlantic and Pacific oceans. Used for ship communications. Military Strategic and Tactical Relay to be launched by US starting in 1994. It is UHF and EHF capable, highly survivable, hardened, and ECM capable. NATO Satellite System. Operated by the NATO alliance; X-band and UHF; Covers Europe, North Africa the North Atlantic and the East coast of North America. The British Military Satellite System. X-band coverage from 102 deg W to 120 deg E and 70 deg N to 70 deg S. Canada currently has an agreement with Britain for capacity on the Skynet space segment. The WSC-3 is a US Navy terminal used to access the FLTSATCOM network. There are many communications satellite constellations in existence, both commercial and military. DND uses several different space segments for voice communications and data on some of these constellations. ANIK Used to support the North Warning System (NWS). INMARSAT Primary function is to provide ocean coverage. INTELSAT Access shared on a first come, first serve basis. 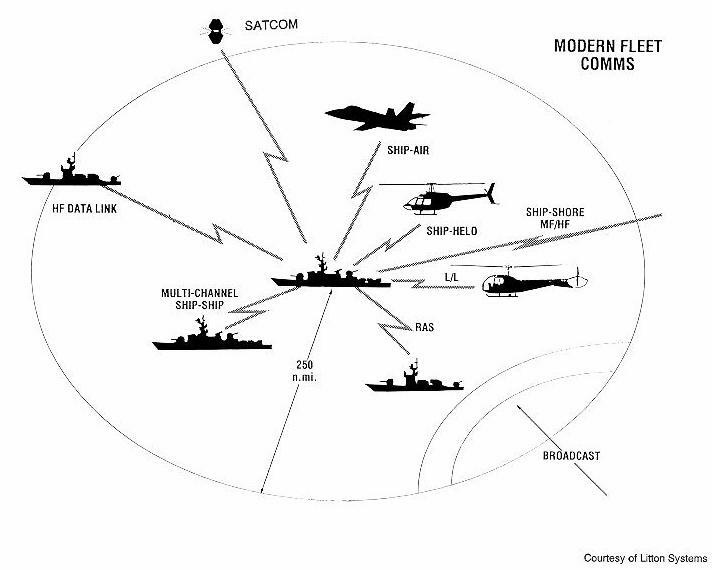 FLTSATCOM A MILSATCOM system used by the US Navy. MILSTAR US Military system using EHF and optionally UHF. NATO Used one geostationary satellite at 18 deg W plus a spare. SYRACUSE The French MILSATCOM system. SATCOM is the only way to provide reliable, global communications in a timely manner. Other means of communications have inherent limitations. High frequency radio lacks the reliability and the capacity required for military operations. Line of sight radios have neither the range required nor the ability to operate in all topographical areas. Land lines are not often not available, take a long time to install and are highly vulnerable to disruption. During the 1992 Persian Gulf War, allied forces relied heavily on SATCOM resources for communications. Both the Royal Navy and the US Navy have backed off from satellite communications to a degree because of the acknowledged vulnerability of the satellites themselves in time of conflict - either physical damage from killer satellites or damage from the electro magnetic pulse (EMP) generated by thermonuclear detonations. In the case of the US Navy, they are having to relearn old skills in HF ship-to-shore operations, and, to an extent, even tactical operations, because they had come to depend on a shorebound pool of expertise available via satellite links. The period 2001 to 2005 is a window of opportunity when the US, Britain and France will be replacing their existing X-band satellite systems (DSCS III, Skynet IV, and Syracuse II respectively). This will present Canada with an opportunity for communications cost saving through co-operative design, development and manufacture of space systems.